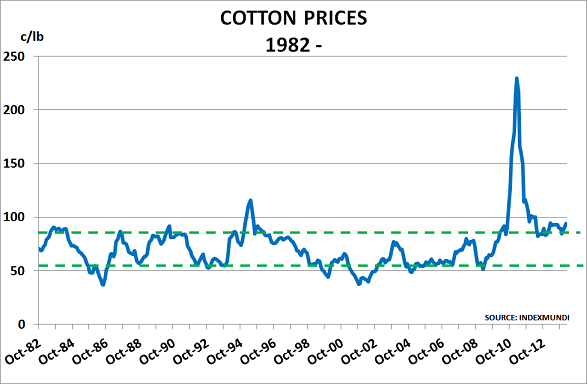 It seems that cotton prices are about to return to normal levels again. The blog’s detailed discussion of the issues last September highlighted how current Chinese government policies seemed doomed to fail, at enormous cost to the wider world. It now looks as though China’s new leadership agrees with this conclusion. Since late 2008, the previous leadership’s policies had placed China in the role of ‘buyer of last resort’ for global cotton markets. This has now become unsustainable, as global cotton reserves today are enough to make 3 pairs of jeans for every person in the world. In addition, it seems that we are seeing a change take place in China’s own policy. The previous policy had been to buy cotton at double world prices for storage, in order to protect domestic farm incomes. The result had been that China had increased its cotton inventory five-fold over the past 2 years. Now the government is to subsidise farm incomes directly. This, of course, will encourage more domestic production whilst reducing the need for imports. It will also achieve the government’s main aim of supporting job creation. But it is not good news for those exporting to China. Its cotton imports were down 36% in January, and this downturn seems likely to continue. So the US may well be producing more cotton at a time when the world’s largest importer is reducing its volumes. It doesn’t take an expert to work out what could happen to prices as a result. The next few months will therefore be critical, as world markets today are still operating against the background of a tight supply position caused by China’s stockpile and the US drought. The new US crop won’t be ready for delivery until December, and clearly weather or other issues could still intervene. But importantly, the December futures contract is already trading at a 13% (11.5c/lb) discount to the current month. This implies traders are starting to assume that prices will return to their traditional pre-2009 range, highlighted by the green dotted lines in the chart. This would be a major development for cotton markets and the global polyester industry. PTA/polyester would face even greater over-capacity problems – unless, of course, crude oil prices also fell to match the lower cotton prices. This highlights how the unwinding of the failed stimulus policies of the past 5 years will cause major collateral damage, even to those who have continued to behave sensibly.